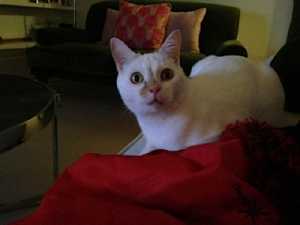 Having moved from the US in August our cat, Leo, has been adjusting quite well to his Notting Hill digs. We knew the cross-Atlantic move was stressful and so when the holidays approached, we thought it would be best to keep him in the surroundings he feels most comfortable with and which he now calls home. Unfortunately for him, because of work and family obligations, our time away in the States would stretch to three weeks over Christmas and New Years and that is when we found Anita! In the weeks leading up to our departure, we met at the house so that she could get familiar with the surroundings and meet our little man. From there, there was a great email correspondence suggesting toys that Leo would enjoy and why it would be beneficial for him to have, as well as a bit of paperwork to fill out, including vet forms, which were easy enough and helped us in feeling more secure that all the boxes were checked prior to leaving. But it was not until we were away that we truly appreciated the wonderful care Leo was receiving by evidence of daily email and video updates! It was so reassuring to know that even though we were 3,000 miles away, he was getting the attention he needs (and deserves). We ended up mixing up many different visits including daily/tv evening/and overnights to keep Leo, who suffers from separation anxiety feeling loved! And he was. When we returned, the house was exactly how we left it with litter and food areas both very clean! And just back from a long weekend in Paris, we were able to use her services again, which proved simple and reassuring. Anita is super accessible, professional, experienced, kind and generous- definitely a “cat person” who gets these amazing creatures, and who we consider to be now part of our extended family! If you have found yourself on this page, are a cat guardian and live in Notting Hill then it’s more than likely that you will be seeking a cat sitter to care for your cat during your travels. Sophie was happy with Catnips cat sitting service and your cat(s) will be too!